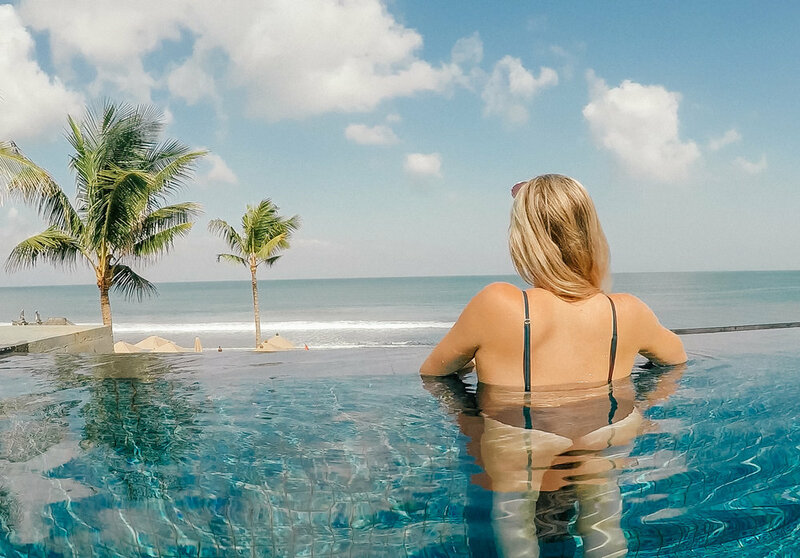 My 10 day Bali itinerary | Where to eat, stay & what to do! Bali seems to be the IT place to go at the moment, at least for us kiwis anyway! Flights are getting cheaper and more accessible which I love because I think I will definitely be heading back there in the near future... I recently spent 10 days here at the beginning of June and loved it. I was actually over here for my birthday cause nobody wants to be stuck at work on there birthday right?! The weather was absolutely perfect with blue skies every single day and the temperature sat around a toasty 28 degrees. I spent time in Ubud, Seminyak and Nusa Lembongan, about 3 days in each. Below is a breakdown of my itinerary, including where I stayed, what I did and where I ate! After collecting our bags we headed outside to the extremely overwhelming crowd of people holding signs for transfers to different accommodation. Combined with the fact that multiple large flights had landed, it made it extremely hard to find our driver! We got there in the end and soon enough we were in our transfer heading to our first accomodation in Ubud, Wapa Di Ume. After about an hours drive from the airport we arrived in central Ubud. Our hotel was then another 5 minutes from here. On arrival we were greeted with a refreshing welcome drink before being shown to our room. My first impression of this place was, wow, the photos on the website did not do this place enough justice. It was absolutely gorgeous, complete with staff as kind as they come. We rode in a buggy to our villa, past a beautiful rice field and across a bridge over a stream. Walking into our villa was so serene. Like the rest of the hotel, it was gorgeous. We stayed in the Di Ume Suite which gave us plenty of space for two with balconies located above the stream, a massive super king sized bed and large bathroom complete with a deep set bath and massive shower. I was in paradise. Ubud could not have made a better first impression and that was largely due to this hotel! By the time we settled in and had finished gawking over our room it was dinner time. Initially we thought it would be a good idea to go into the main centre and find somewhere for dinner. Since we had been up since 3am we decided to screw that idea and just eat at one of the hotel's restaurants. There were two choices, one with Balinese food and one with international food. Being our first night we played it safe and went to the international restaurant. Being located right by the infinity pool, hearing the sound of the water falling over the edge was incredibly relaxing and nearly put me to sleep! The food was great, staying with the unadventurous theme we ordered pizza, and getting complimentary bread at the start of the meal was a great bonus. After dinner when we went back to the room and literally passed out. It was only about 7pm but we couldn't keep our eyes open any longer. We woke up feeling refreshed and ready to go...at 3am. No matter how hard I tried I couldn't fall back to sleep, my body was ready to start the day as it was already 7am back home. Obviously there's not much to do at 3am so I didn't actually get up until it got light at 6.30am. By 7am we were down at the lobby and ready to head off to the Tegalalong rice terraces. The hotel called a taxi for us and we arranged that he would stay and wait for us while we had a look around, then drive us back. This worked out really well because there wasn't many taxis at the rice fields! We paid 400,000 rupes and thinking back we probably got a bit ripped off but it was our first day so we hadn't quite got a gauge on pricing yet. Thinking back it probably would of been worth asking the hotel what we should've paid before leaving. Our driver was incredibly helpful though, even giving us small change to pay for the entry tickets (10,000 rupe) since we hadn't broken any larger notes yet. The rice terraces are gorgeous and definitely a must do in Ubud! Would highly recommend going here early though because it gets very hot very quickly. It was about 8am when we got here so there wasn't too many people around which was great. It can be hard to find a way to get down to the terraces but we were lucky that our driver was so kind and showed us where to go! After spending about an hour here we headed back to our hotel for breakfast cause we were starving. If you are staying at Wapa Di Ume the French toast is not to be missed!! Feeling rather traumatised after seeing a guy nearly get attacked because he pulled a monkey's tail (so disrespectful, the guy deserved it in my opinion. Poor monkey!) we left and made our way back to the centre. Couldn't resist looking in some of the shops on the way back and the aircon was a great escape from the heat! We also stopped by the markets to have a look around while waiting for our shuttle. If you want knick knacks to bring back home this is where you want to buy them. You can barter here so you never know what bargins you'll be able to snag! Back at the hotel, while chilling out at the pool, it hit us how tired we were and once again we decided to have a night at the hotel rather than venturing out. We ate at the international restaurant again and had an early night. Not super adventurous but when your jet lagged and exhausted it's important just to listen to your body! So I woke up extremely early again...naturally I'm a pretty early riser so the combination of jet lag meant I was wide awake at 4am. Better than 3am I guess? After breakfast our driver met us in the lobby for a 9am start. We booked our driver through Buffalo tours and they were amazing! We got free water through the day and there was wifi in the van. You could tell both guys were truly excited to show you around their beautiful country. Since we had been to the rice terraces yesterday we started our journey at the Tegenungan waterfall. There were a couple other waterfalls I wanted to visit but we just got to see the one because turns out they were further away than I thought! I google mapped the drive from our hotel while back home when I was doing research for our trip but turns out, whatever drive time google maps show you, double it. The roads are so windy and busy it takes way longer to get places which we quickly learnt! We got to the waterfall at about 10am which was perfect as we got here before all the tour groups. It is possible to swim here but we gave this a miss, along with many other people as the water flow was pretty heavy so there was a strong current. You can walk to the top of the waterfall which is pretty cool and there is a swing here if you feel like handing over a small donation but since we were heading to the Bali Swing later we gave this a miss. Next on the agenda was visiting the Me Sari Luwak Coffee Agrotourism. When in Bali you may hear the locals talking about luwak coffee that is unique to their country. What's different about this coffee is the process in how it's made. The luwak eats a particular coffee bean and once it passes through the animal this is then used to make the coffee. It's pretty unique alright! You may also hear it called Kat-Pu coffee. Now at this plantation a guide talks you through the coffee process in more detail and you get to see what luwak's look like. After this quick 10 minute tour, you get to sit down, enjoy some banana chips and taste test a whole lot of teas coffees. Did I mention that all of this is complementary?! It's incredible how generous and welcoming the Balienese are. It's a great little glimpse into their culture and worth a stop if you are in the area. Our last stop of the day was the Bali swing! I was super excited for this because I love a little rush of adrenaline every now and then. I knew it would be pretty tourist and I was right, it was also more expensive than I first thought at $35 USD for a ticket. One thing I didn't realise is that there are multiple swings and this ticket gives you entry to all of them, unlimited times! There is also a buffet lunch so you do end up getting your money's worth at the end of the day. We arrived back at our hotel around 3pm and relaxed by the pool before our massage appointment. The spa at Wapa Di Ume was so luxurious, it's not to be missed. I felt soo relaxed and totally not ready for the culture night we had ahead of us. To perk back up, we sunk a couple of happy hour G&Ts before heading to the main area of our hotel where the show would take place (Tip - alcohol in Bali isn't cheap, bring duty free alcohol over with you if you can!). I wasn't familiar with Balinese cultural dancing so it was pretty cool being able to see this first hand. We also received a traditional buffet dinner which was delicious and the only time I actually ate Balinese food for our entire trip...I'm not a big foodie! The only thing I wouldn't recommend was the sweaty Bali layer cake which we got for dessert, and yes that is the actual name of the cake. Finally I was starting to wake up at a more reasonable hour! Today we were checking out of Wapa Di Ume and leaving Ubud for Seminyak. Our drivers from Buffalo tours picked us up again and transferred us to our second accommodation, Alila Resort. The drive took us about 2 hours and I made sure I filled up on the French toast, that I will be dreaming about for the next few months, before we left! Seriously it's that good. Upon arriving in the Alila Resort lobby I was in awe. This place was flash! It had two infinity pools featuring views so gorgeous you don't even want to blink and a third pool surrounded by sun loungers and beanbags. I was in my happy place and I never wanted to leave. But then we got hungry...and the food prices at this place were higher than back home so we dragged ourselves away from the pool in search of somewhere cheaper to eat! Sea Circus was located super close to our hotel and this was high on my list of places to visit. The vibe here is super cool and the food was delicious. We ordered fries (which tend to feature in nearly every meal), pulled pork tacos, chicken tacos and of course I couldn't resist treating myself to a frozen mango and lime margarita! It wasn't long before we found ourselves back by the pool watching the sun go down. Then guess what, it was time for more food... After a hectic day of relaxing we didn't want to venture too far, and by not far I mean not even past the end of our resort's driveway. Luckily Sea Vu Play was actually located in the same driveway as our hotel, along with Mrs Sippy. We decided to go to Sea Vu Play, this place wasn't actually on my list but I had heard of it and was curious to see what the food was like. It had a similar vibe to Sea Circus but was a lot bigger and more suited for dinner. We ordered the captains share plate because we were indecisive and wanted everything. If you aren't a fan of meat I wouldn't recommend this platter as that was pretty much all it was! But it was delicious! Today I was super excited because we were heading on a VM Kombi cocktail safari organised through Urban Adventures. I have a soft spot for VW Kombi's so this was probably the main reason behind my excitement! To start off the day we met the group at Ku De Ta (a very popular beach club - worth a visit if you're in Seminyak!) which was located within walking distance of our hotel and the tour kicked off at about 12pm. There are 4 people to a van so we were joined by another Kiwi and an Aussie who were lovely. Our guide gave us a bit of an introduction to the tour and told us a bit about Bali while we drove to our first stop, La Brisa. Wow this place is seriously cool. It has such an awesome vibe as soon as you walk in and the decor is breathtaking. They've thought of every little detail in this place, there's even a pool you can cool off in! The location of this place is also amazing, set right on the beach with stunning views of the ocean. We didn't eat here as we were still full from breakfast so we just ordered a drink. The food did look really good though so would highly recommend checking this place out! After spending about a hour chilling out in the warm Bali sun we moved on to our next spot which was an ancient temple. The temple we visited is a bit off the tourist track so it was pretty cool to see something we wouldn't of otherwise visited! Our guide was great and took us through the temple while telling us about it's history. In these temples you need to have your shoulders and knees covered as a sign of respect. The tour company actually had some traditional sarongs for us to put on, then I also put on the shirt I had bought with me in my bag. Once we had finished up at the temple it was about 2pm and time to grab some lunch, we were starving! Our lunch spot was at Hotel Tugu Bali at the Ji Terrace By The Sea restaurant. First impressions of this hotel when walking in was that it was very dark but once we walked out the back towards the sea and headed up to the third level we were greeted by stunning views of the ocean. I'm not sure whether I was just super hungry or if the food was just that good, but I quite possibly ate the BEST Cabonara of my life here. Now I'm not a big foodie and I like pretty basic dishes so when I say I like something you know it's good! However the delicious food was probably about as good as this place got. There was a nice view but it's similar to what you can get elsewhere and it definitely wasn't as beach front as La Brisa. Our food also took ages to come out and the meals were quite expensive by Bali standards. If you are in the area and love Cabonara then it might be worth a visit but I wouldn't recommend going out of your way to go here. La Plancha was our last stop and I was pretty excited for this one. Have you ever seen those photos on Instagram of all the colourful umbrellas and beanbags on the beach? Well this is the place! La Plancha wasn't actually on the agenda but our guide very kindly let us end the tour here. The places we had been visiting throughout the day had been a bit on the expensive side so we wanted to go somewhere to relax and watch the sunset on the beach. La Plancha was perfect for this! Yes it's crazy busy and people come up trying to sell you stuff while you are sitting on the beach but I think that's all part of the Bali experience. I ordered the watermelon cocktail and it was delicious! After the sun went down and we had finished our drinks we headed back up to the main street to find a taxi. When catching a taxi in Seminyak you want to look for Bluebird taxis which are light blue. These go off the the meter so you know you aren't getting ripped off - always a plus when in Bali... On arriving back to our hotel we popped up to our room to freshen up a bit then headed straight to dinner before we passed out in our rooms. It was a pretty full on day and we were exhausted so we headed back to Sea Vu Play, 1. because the food we had eaten there the night before was delicious and 2. it was less than 100 meters from our hotel! The morning started off pretty relaxed after breakfast. We just went straight from the restaurant over to the pool and didn't move until it was time for our massage! Being our last day in Seminyak we didn't have too much planned as we wanted to do our own thing and just explore the shops. Now surprisingly I actually didn't buy anything...shocker I know! It's not that I didn't find anything I liked, there were plenty of cool boutique shops, I just wasn't prepared for the prices of everything! You imagine Bali to have cheap shopping however this definitely wasn't the case in Seminyak, unless you went to the markets. A nice dress cost $80 - $100 which isn't that expensive but it's the same price that I would pay for a nice dress back home. Of course being winter back in New Zealand I would have to wait another 6 months before I could wear what I bought again. I was a bit disappointed and it certainly wasn't what I was expecting because I'd never really heard anyone mention that the prices of clothes of there were high. I'm sure there are some places where you could grab a bargain but we'd had enough exploring in the heat and were ready for some more food...nothing new really! We made our way to Cafe Organics for lunch. I'd heard good things about this place so I was excited to see what it was like. We arrived there around 2pm which was perfect because it wasn't too busy. We found we were eating lunch at rather weird times of the day because our buffet breakfasts would keep us going for hours! Turns out this actually worked out in our favour because the places had usually cleared out by the time we were hungry. I ordered a Acai Coco Smoothie Bowl, they are my fave and I had been craving one since the minute I set foot in Bali! It was delicious and Kim ordered the falafel pocket which looked equally as delicious. 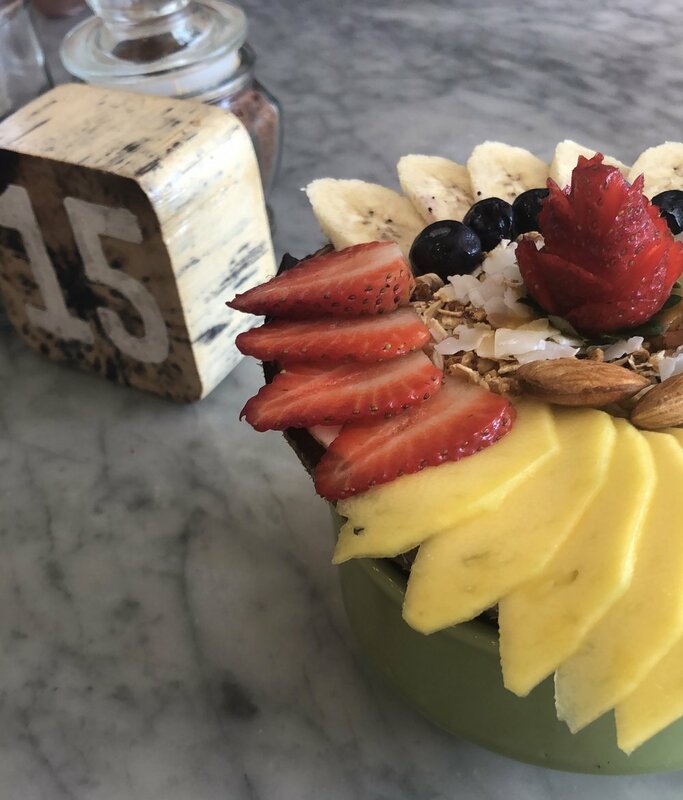 Another place I wanted to try was Nalu Bowls but unfortunately we ran out of time to make it here. After our tummies were full again we slowly made our way back to the hotel, stopping in a few more shops along the way hoping to find some fab bargains. unfortunately no such luck. I was also super disappointed that when we walked past Mads Pop, which is a popular ice-cream place you'd recognise from Instagram, it was closed for cleaning :( I LOVE ice-cream and by this point in the afternoon I really needed something to cool me down so I settled for the frozen yoghurt place just down the road. Seminyak just seems to be about food, food and more food! After having a bit of down time at the hotel we headed to Motel Mexicola for dinner. This place is seriously cool! If you are spending some time in Seminyak you HAVE to go here for dinner one night. Not only is the food amazing but the music is great and it has such a fun atmosphere! Later on in the night when everyone's finished dinner they clear the tables for people to dance on. Unfortunately we didn't hang around long enough to see this because we accidentally crashed a private function... When we clicked as to what was a going on and the people we were dancing with actually all knew each other we felt super awkward and then left, whoops! Half way through the night I had woken up with a pretty sore tummy and it was still hanging around in the morning. Our morning plan of exploring some more shops quickly turned to custard and we ended up relaxing by the pool until it was time to check out and drive to the Sanur port to catch the boat across to Nusa Lembongan. However we did find the energy to go to the Bintang supermarket and buy some vodka because, priorities. If you need to buy spirits while over in Bali and want to make sure you are buying legit stuff, this is the best place to go. Our driver picked us up from our hotel at 11.30am in time for our 2pm boat. The drive took about an hour and a half to get to Sanur so we arrived in plenty of time! The company we booked the boat through was Rocky Fast Cruises. Our tickets were already prepaid and they included transfers to our hotel however you can buy tickets on arrival. At 1.30pm the staff start collecting your bags to take them on to the boat. There isn't actually a pier at Sanur, the boats stop as close to the beach as they can then the staff members hoist your bags on top of their heads then walk them out to the boat... Now if you're paranoid like me and you are travelling with electronic equipment I would recommend taking this out of your main bag and putting it in a backpack. I never saw any of them drop anything but if they were going to, I feel like it would be just my luck that it would be my bag! After having a bit of a travel day we were pretty exhausted and wanting to escape our small room we headed straight down to the beach club at our hotel for a swim. The pool here was amazing, right down by the beach it was the perfect spot to drink cocktails and watch the sunset. Which is exactly what we did! I probably felt the most relaxed I had been the entire trip. The food at the restaurant was also amazing. Still located at the beach club you could here the relaxing sound of the ocean throughout your meal. The potato croquettes are an absolute must! We retreated back to our room for, what we hoped would be an early night. This however, was not the case. We were located in one of the deluxe rooms above the lobby which was right next to the road. Directly across the road was a bar and at this bar there was some very loud live music. The room must've had no sound proofing of any sort because we could hear EVERYTHING. Now I'm really not the kind of person to complain, but I like my sleep and so does Kim so when it got to 10pm and the music showed no signs of stopping, we weren't happy campers. To make matters worse the blinds didn't keep out the street light so the early night I was hoping for didn't quite happen. Today we were doing a tour of Nusa Pendia that we booked through DiscoverNusaPendia.com. This was the day that I was the most excited for out of our entire trip and oh my god it did not disappoint. If I could only use one word to describe this day it would be WOW. I'm going to have to do a separate, more detailed blog post on this day because there is just so much to cover! We swam with Manta Rays, saw some amazing coral and fish, swam at Angels Billabong, visited Broken Beach and stood at the top of Kliengking beach. The great thing about this tour is you can do it from Bali, it would just be quite a long day but it is possible! 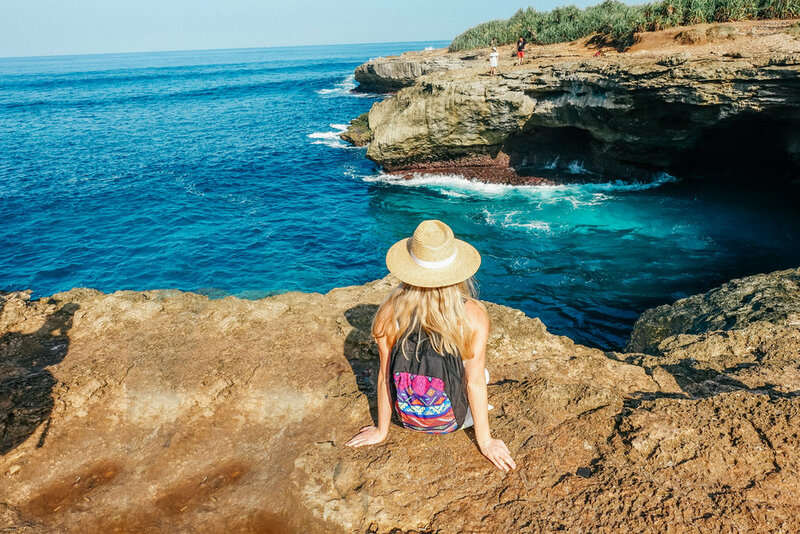 So you don't just have to be staying at the Nusa Islands to get access to this incredible day tour. Now if you are a little hesitant about snorkelling and swimming with Mantra Rays my advice to you is to just do it! They are such incredible creatures and totally harmless. The way they glide through the water is so graceful. It is an absolute must do here in Bali!! Upon arriving back to our hotel, we were in absolute awe of Nusa Pendia. I had such a fantastic day that exceed all of my expectations and to top it all of, we scored a room upgrade to our very own pool villa! We had talked to staff about the noise in our room and they kindly offered to move us into one of their pool villas. We did have to pay a little extra but omg it was so worth it. Waking up this morning in our private pool villa was the best birthday present ever! I had a great day of exploring planned and a perfect nights sleep was exactly what I needed. To start off the day I face-timed Mum & Dad back home and my boyfriend who all wished me happy birthday before heading down to the restaurant to enjoy a buffet breakfast. After breakfast we were off exploring the island. Our first stop was Devils Tears and Dream Beach which are located right next to one another. The hotel dropped us off in a buggy which was an adventure in itself, a lot of people seemed to travel round the islands this way. In fact, the whole time we were there I don't think I once saw a car. We wandered over to Devil Tears first which is a blowhole. It was pretty stunning, the water is a gorgeous shade of blue and we were lucky enough to catch the shimmer of a rainbow amongst the spray of the waves. There were a few people around but not nearly as many tourists as we had encountered in Ubud and Seminyak! That's what I loved about the Nusa Islands, they aren't as well known as the other parts of Bali so they are largely still quite underdeveloped. After we had snapped a few pics and were done admiring the view we headed across to Dream Beach. We were actually hoping to swim here but the sea was actually a bit rough and there were quite a few rocks in the water so played it safe and skipped the swim. There were some restaurants here which you can go relax at but we were still stuffed from breakfast so we just walked along the beach dipping our toes in the water. Since we didn't swim, we didn't spend as much time at Dream Beach as we thought we would so we decided to walk to our next destination. When our driver from the hotel dropped us off he said you can catch a taxi but since we had plenty of time and wanted some exercise, walking it was! From Dream Beach to the yellow bridge it took us a bit longer than we had first thought, google maps also took us down some rather questionable roads but after about an hour we had made it to the yellow bridge. 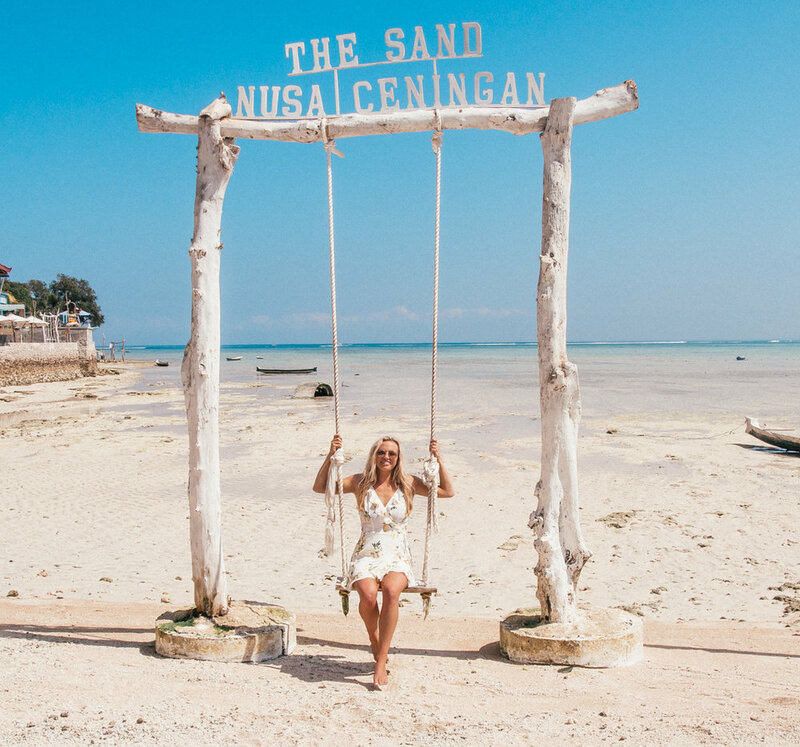 This is what connects Nusa Lembongan and Nusa Ceningan, making it super easy to explore two islands in one day! Only scooters and pedestrians can go across the bridge so we continued with walking until we reached The Sand on the other side. We stopped here for a cold drink and a bite to eat before carrying on to Blue Lagoon. The Sand was super cool however it was rather spoiled by the creepy staff. If you can get over them then its a great place to chill out for a couple hours. It's set right on the beach complete with an overwater swing. Feeling refreshed we carried on to Blue Lagoon which was another 20 minute walk. We were certainly exceeding our 10,000 steps today! By the time we arrived at the Blue Lagoon we were super hot and so ready for a swim. Now I'm not 100% sure we actually ended up at the Blue Lagoon because it was kind of hard to find. We did pass a sign saying Blue Lagoon lookout but we kept walking because all we really wanted to do was get down to the water. We found a way down to the beach eventually and cooled off with a much needed swim. Now came the hard part, making our way back. We didn't get lost but I think we did get a little bit of heatstroke because I didn't feel too flash later on. We also got pretty damn sunburnt. Of course we reapplied but I think we were just exposed to the sun too long and there wasn't really a whole lot we could do about it because there were no taxis! And jumping onto the back of some randoms guys scooter wasn't too appealing. About an hour and a half later we made it back to the hotel, once we got across the bridge we were able to find a taxi but even that was pretty questionable. There was a moment where we thought we weren't going to make it back in one piece but we got there in the end! The rest of the day was spent drinking cocktails, swimming in our private pool, watching the sunset at the beach and ordering room service for dinner while drinking more cocktails. Best birthday ever! What did our last day consist of? Eating, swimming and tanning, the perfect combo. Our boat back to Sanur wasn't until 4.30pm so we were in no rush. We made the most of our villa until it was time to check out, then we continued to relax at the beach club. Our flight wasn't until 11pm so we knew it was going to be a loooong day! I even had a little bit of a nap after lunch in the hope that would keep me going until we got on the plane. When it was time to leave Rocky Fast Cruises picked us up and took us to the boat. Same process again, keep your valuables you would rather not get wet on you, just in case! Even though we had quite a while till our flight when we arrived back in Sanur we decided to go straight to the airport because what else were we going to do? At least the airport had wifi and places where we could charge our phones. After what felt like forever, it was time to get on the plane. Only in Bali can you board two planes from the same gate... Beware of this when you are there because our flight wasn't coming up on the board telling us where to check in, so we thought we had ages to get through security etc. After asking some of the airport staff when it got to two hours before our flight, they told us where to go and we ended up rushing through the airport. Certainly not ideal. At least we weren't the only ones, a lot of other people on our flight also got pretty confused so it ended up being delayed. We all made it on the plane safely and after what felt like a lifetime, we were arriving home in Auckland. Did I love Bali as much as I thought I would? YES. Would I go back? 100%. Now that I've visited the main towns and done a lot of the touristy activities I would do things quite differently next time I head back. Instead of Seminyak, I would spend time in Canggu and Uluwatu. I would probably give Ubud a miss, I loved the vibe and our accommodation was amazing but I feel like I've seen and done everything that I would want to do there. I also want to make it out to the Gili islands. The Nusa Islands were absolutely gorgeous I would love to return to these one day but I think I would want to see the Gili Islands first as a comparison!